GetShot™ is a Windows-based program that automates Tetracam camera image capture and storage. The program may be configured by the user to remotely trigger an ADC or MCA camera via its USB streaming interface at intervals set by the user. The captured image may then be retrieved by the host computer and saved to its own hard disk or any storage location that is accessible by that computer. GetShot™ is ideal for situations in which it is desired to remotely trigger a camera from an unattended computer and then have that computer distribute images to other networked locations. One example application might be for a research team capturing time-lapsed images of the undergrowth in a rain forest for storage on a computer mounted in the forest canopy. Another would be for capture of images in a University nursery that would be transferred to a server accessible from classrooms. GetShot™ runs on any Windows XP, Vista or Win7 32-bit Operating System. The program does not run on Windows 7 64 bit systems nor on systems equipped with Windows 8 OS. The program is compatible with every Tetracam multi-spectral imaging system with the exception of the ADC Micro. GetShot™ runs in two modes; one for ADC cameras and one with expanded capabilities for Mini-MCA cameras (see images showing GUIs below). 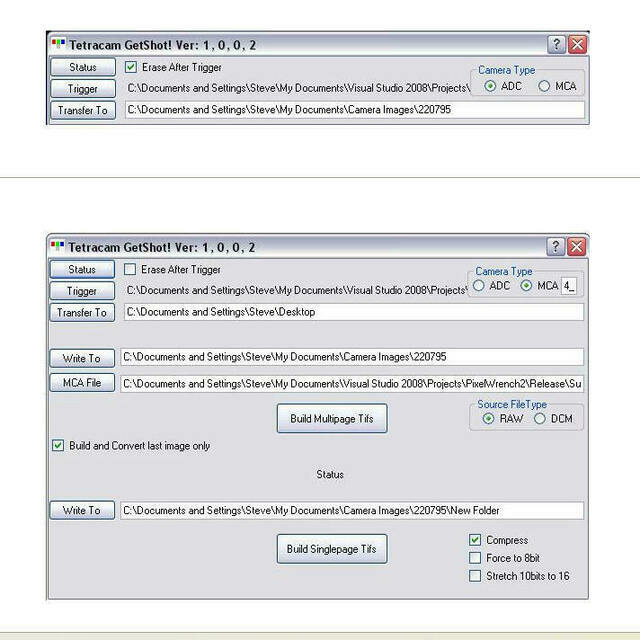 The program is interoperable with the entire suite of other Tetracam programs, DLLs and utilities (see Tetracam Application Software Overview).